Nixtamalization is getting a lot of buzz these days, especially with the many vested in preserving and promoting the traditional foods of Mexico. For anyone else interested in authentic flavors and elemental nutrition it should matter, too. It seems we have come full circle from what the Aztecs knew centuries ago. The Aztecs would grind the kernels of their maize or field corn against the limestone rocks found in the riverbeds, and they discovered the beneficial interaction between the two. They noticed how their bodies responded after eating corn that had been ground in limestone. This corn did not cause digestive problems and gave them energy and spiritual alertness. Scientists have since confirmed that lime releases niacin, an essential amino acid, in the corn. The increased health benefits of nixtamalized corn are substantial: it can reduce bad cholesterol, increase good cholesterol, and contribute to the optimal functioning of other body processes such as digestion, cellular repair and elimination of toxins. Niacin also seems to reduce the level of triglycerides in the blood and much more. 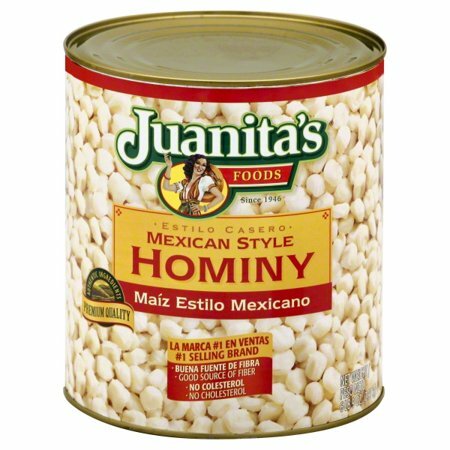 Hominy is made with either white or yellow corn, but specifically it is from flint or dent corns which have a tougher outer seed coat than others. Soaking the kernels in an alkaline solution loosens or dissolves this outer portion. In the process, the kernel absorbs water and the alkaline solution which is key to nixtamalization. When cooked, the chemical composition of the kernel is altered, boosting the nutritional value of maize. This process also provides hominy with its readily identifiable flavor and chewy bite. Posole, hominy, nixtamal, are all the same thing: they are corn that has undergone the nixtamalization process. Posole, a derivation of the Nahuatl word for hominy, has come to broadly refer to a soup or stew made with hominy. So popular is posole in Mexico, it is considered a national dish, with various regions proclaiming their unique version as the best. Here’s an easy posole made with a combination of pork, tomatillos, and pasillas or other hot peppers. 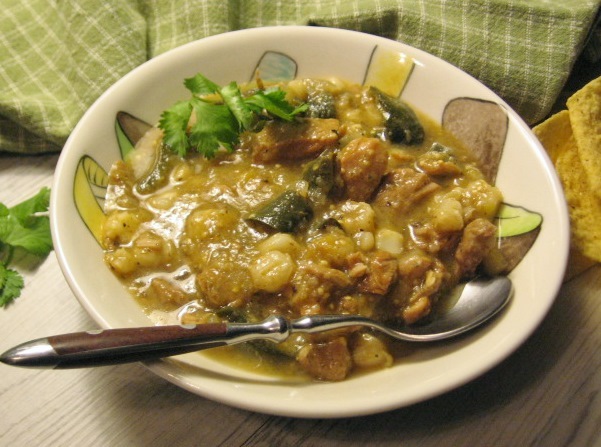 The hominy and tomatillos provide added thickening power and flavor that melds with the pork into a rich and supple stew. Serve it straight up in bowls with favorite toppings like avocado, cilantro and crema. Or, cook it down until thick for a tortilla filling. Enjoy with spicy slaw, fresh avocado, salsa, cilantro and whatever else pleases you! Heat 1 tbsp. oil in large pot over medium heat. Add the onion and sauté to soften, add the pepper strips, 2 cloves garlic cut into thin strips, and continue to cook until the peppers have softened and garlic is aromatic. Remove all from pot and set aside. Season the pork strips with salt and pepper. Increase the heat to medium high and add remaining 1 tbsp. oil to the pot. When shimmering add the pork and brown on all sides. Add the third clove of garlic cut into slivers, and toss briefly along with smoked paprika and oregano. Stir in the tomatillos, crumbled tomato bouillon, a dash of hot sauce, the corn tortilla pieces, water to barely cover the pork, and stir to combine well. Cover and simmer for 45 minutes to an hour, until the pork is tender. Or, to use multi-cooker, seal the lid, bring to high pressure and cook for 25 minutes. Turn off system, let pressure come down naturally for 10 minutes, then release remaining pressure. When the pork is tender add the reserved onion and pepper medley. Stir in the hominy and simmer over low heat for 30 minutes or longer, until flavors are well blended and the posole has thickened. Adjust seasoning. Serve the posole in bowls with favorite garnishes. Serves 4. These days I’m channeling spring—seriously. Soup still remains a favorite, but now I’m looking for light, bright flavors that will dance right out of the pot. Happily, this easy, green posole does just that. 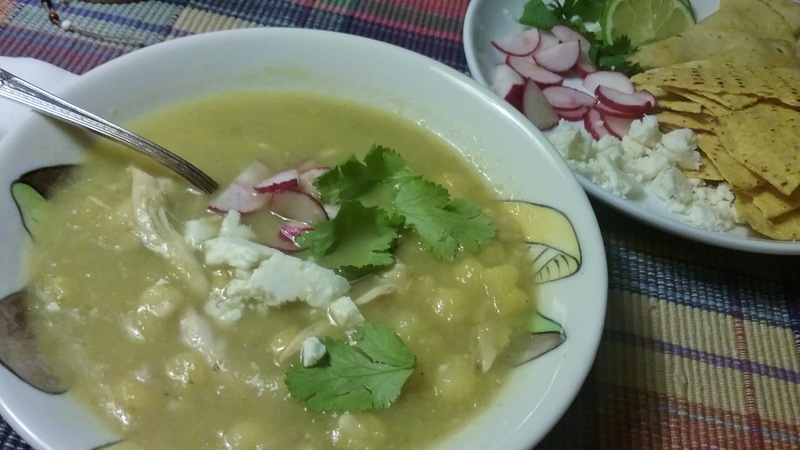 It still has hominy to deliver its characteristic flavor, but instead of dark stewish elements like pork and guajillo or ancho chiles, this soup gets its power from tomatillos, jalapeno peppers, and chicken or vegetable stock. The secret comes from giving tart tomatillos and other vegetables a quick roast in the oven. This yields surprising depth and unexpected character, no thin imposter here. It’s all transferred to a soup pot with chicken or vegetable stock and pureed lightly with an immersion blender. I like keeping a bit of texture for a touch of rusticity. The soup is heated with hominy and a few sprigs of cilantro tied with a bit of string, making a bouquet garni for easy removal. For a more robust soup, add a few handfuls of cooked shredded chicken. If it needs more flavor, give a squeeze of two of fresh lime just prior to serving. My soup needed absolutely nothing. No question, this brilliant posole is meant for any time, any occasion. In fact, in a lighthearted Irish moment, it could very well be a breath of fresh air—spring green air, at that. Toss the vegetables with olive oil to coat, salt and roast at 450 degrees for 20 minutes. Place roasted vegetables in soup pot with 1 cup stock. Puree lightly with immersion blender leaving a bit of texture. Add remaining stock, hominy, and cilantro stems tied with string. Bring to a boil simmer 15 minutes to blend flavors. Adjust seasoning. Remove cilantro, serve in bowls and pass garnishes. Serves 4.